April 19th, 2019 — X.D. Network are excited to announce that Muse Dash, the rhythm action title from PeroPeroGames, is coming this June to PC and the Nintendo Switch! Having established a passionate following in Japan, and after extensive fan requests for PC and Nintendo Switch versions, Muse Dash will finally hit both platforms with a limited-time exclusive Marija skin on PC and Nintendo Switch, and all DLC from previous versions included for the Nintendo Switch! Given the Players’ Choice award by TapTap and best indie game of 2018 awards from other platforms, Muse Dash has secured a special spot in many players’ hearts, and now the waifus are here to collect yours too. The team teased fans with a Nintendo Direct peek, but the time is officially coming to test your twitch reflexes on new platforms with over 80 unique J-Pop, Pop, Trance, and Vocaloid songs to play, and 3 Anime heroines (voiced in Japanese) to choose from as playable characters! Simple 2-button controls make Muse Dash easy for players to jump into, with action side-scroller mechanics like traditional rhythm game instrument solos, timed dodges, and beat-based enemy attacks all mixed together to mash the perfect jam. Rhythm game players will also find depth in Muse Dash, as mastering each song takes more than just a few tries. Each song comes with trophies to unlock, leaderboards to make your mark on, and 3 difficulties to suit your style. Focus on your rhythmic abilities while keeping those reflexes strong to become a true master of Muse Dash! Players’ choice of songs is also reflected in how Muse Dash plays, as different musical genres present varied challenges. Explore the full musical lineup to see a wide variety of locations, enemies, and bosses this Summer on PC or Nintendo Switch! Leaderboards for each song to challenge yourself against the very best in Muse Dash! The PC and Nintendo Switch versions of Muse Dash will include English, Japanese, Korean, Simplified and traditional Chinese localization options for players to choose from. The Nintendo Switch version will launch on the e-shop in Japan, North America, Europe, and Australia with DLC included, while the PC release will be worldwide with DLC available separately. April 18 2019 – Indie publisher Digerati and one-man developer Nerdook (Monster Slayers, Vertical Drop Heroes) are delighted to announce that turn-based strategy RPG Reverse Crawl is coming soon to Nintendo Switch – the game will be available to download from the eShop from May 10th. The Switch version features an all-new local PvP mode to complement Campaign and Endless modes, while the game’s UI has been specifically modified for Nintendo’s console. Reverse Crawl inverts the classic dungeon crawling premise, putting players in the claws and armored boots of monsters, undead, and other fantasy enemies in a quest to defeat heroic warriors and their Red Queen. Includes a brand new local PvP mode, created exclusively for the Nintendo Switch version. IRVINE, Calif. – April 18, 2019 – Whoaaa, Nelly! 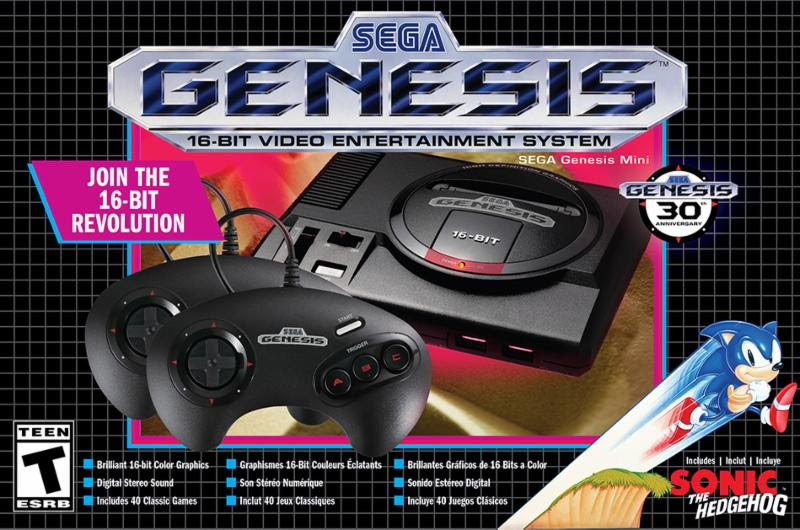 It’s time to run and jump our way to the next lineup of timeless classics making their way to the SEGA Genesis Mini with some of the biggest characters in video game history. Snooker 19, the Definitive Virtual Depiction of the Sport, Hits Nintendo Switch Later this Spring! April 17th 2019, Liverpool, United Kingdom – Ripstone Games, in collaboration with Lab42 and World Snooker, have today released Snooker 19 on PC, PlayStation 4 and Xbox One. Snooker 19 is available for purchase on Steam, the PlayStation Store and the Xbox Games Store for $34.99 / €34.99 / £29.99. A Nintendo Switch launch of Snooker 19is due later this Spring.